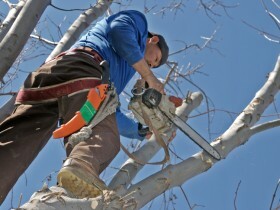 I’m Luke George, and after being in the tree removal business for ten-plus years (on businesses, ranches, farms and residential properties), I started to feel that other companies I’d worked for had left customers wanting. I’ve spent the last ten years honing my skills and building a hardworking, competent team to take on tree trimming and removal jobs. In a business where there are plenty of less-than-professional operators, we’re fully insured through State Farm (for your protection and ours). We’ll always do a walk-through with you and the crew to discuss your needs and our plans before any work starts. We’re also happy to direct you to our many references – chances are you might even know some of them! We aim to leave your property in better shape than we found it, removing dead limbs, branches and debris at the wrap-up of every job. We never use grinders to dispose of debris – while many people like to use the mulch for gardening projects, it’s also something that can promote the spread of oak wilt. Grinders are loud, obnoxious and cumbersome; instead, we haul all branches and debris on a trailer back to our brush dump, where they are recycled. Trailering debris also increases efficiency by allowing us to spend our time doing tree work and cleanup, rather than tying up one or two men standing around operating a grinder. Speaking of oak wilt, we are also extremely careful to sterilize all tools and seal any wounds from trimming, specifically to head off the chances of spreading oak wilt. Our commitment to quality work has paid off for us. We feel our reputation is based on our last job, and that every job should be our last job to date. 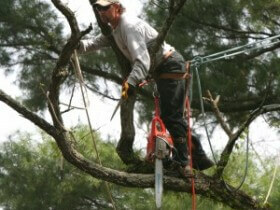 At least half of the jobs we do are on a referral basis, and we’d like for your trees to be our next job. Your trees are more than property; they’re a big part of what makes your property your home. They bring welcome shade and beauty to your house as well as an intangible set of benefits that contribute to your home’s “curb appeal” and charm. They are, however, something that needs regular maintenance…and are often too far down on the list of a homeowner’s priorities. 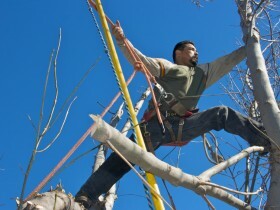 Give us a call and we’ll come out for a free consultation on your tree care needs and our approach. We’re sure that you won’t come away disappointed. Watch HD streaming movies on https://www.123movies.love/ without registration.